SP Brewery recently recorded another significant milestone in safety compliance at its’ Lae brewery. An operating company of the HEINEKEN, SP Brewery considers Safety as priority. Safety is the first work behaviour under that is known as the company’s Greenprint to Win Behaviour. As of 26th September 2017, the SP Lae Brewery recorded 730 (two years) accident free days, affirming the company’s seriousness in maintaining Safety at the workplace, as is expected by all companies operating under Heineken. 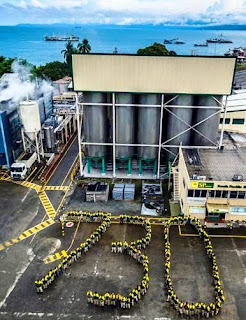 The Lae Brewery, with a 150 employees, celebrated their milestone recently. Present to congratulate them was Managing Director, Stan Joyce, who said they are a role model of the two breweries. The Port Moresby brewery achieved 365 accident free days in August 24th 2017. “People are an important asset in the company, therefore, we must ensure our employees go home safely to their families”, said Mr Joyce. “Our positive safety result is a testament of team work and proves that SP Brewery is committed to ensuring our staff is provided a healthy and safe working environment.